We are sad to report the loss of another wonderful greyhound. We got a phone call from Judy Riley this past week. Her greyhound, Bentley, was limping and his leg was swollen. After taking him to one vet and the emergency vet, she still had no answers. When she called we advised her to ask her vet for a referral to another vet. However, yesterday, she called to report that Bentley’s limping was much worse and the swelling had become much worse. She took him back to the vet and x-rays revealed that his leg had broken badly. Evidently, he had osteo which did not show up clearly on the earlier x-rays. Because of the severity of the break and his age, Judy chose to let Bentley go. Judy adopted Bentley from our group in June of 2006. Bentley was eleven years old. 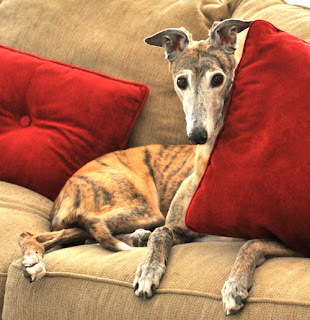 Judy and her family also adopted another greyhound from our group a few years ago. The family is very broken up and sad about losing Bentley. However, they are great adopters and we know that Bentley had a wonderful home.